Axl Rose on August 18, 2016. One of the world's best selling hard rock bands of all time, it's no wonder that Guns N' Roses was able to mostly fill Dodger Stadium on Thursday night (the band is also set to perform at the baseball stadium on Friday, Aug. 19). Performing for just under three hours, original members Axl Rose, Slash and Duff McKagan backed by a capable quartet of other tattooed players delivered a dream set throughout the aptly-pegged "Not in this lifetime..." themed concert stop. From the time the band took the stage and opened with "It's So Easy," fans cheered the returning heavyweights. While the "reunited" lineup of GnR performed a warm up show at the Troubadour (where Axl broke his foot) and subsequently performed both weekends at Coachella in April, this night easily outdistanced the band's performance this writer caught at the second weekend of Coachellafest. 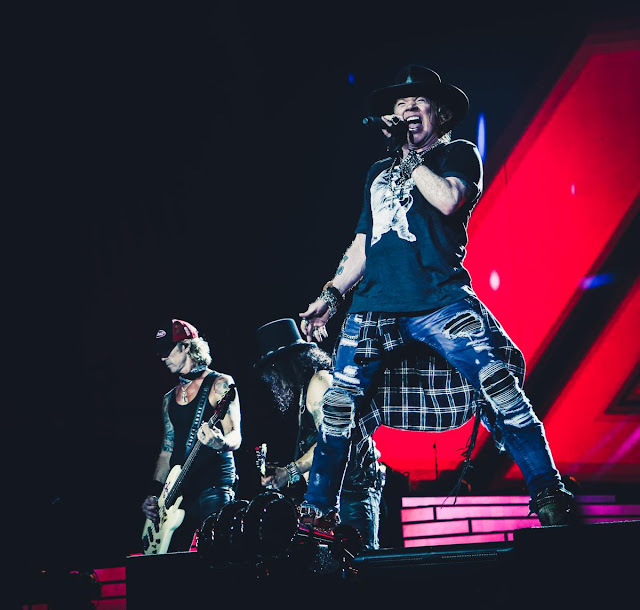 Not only did Axl look fit and run about all night while hitting all the high notes, the ensemble was locked in and delivered nuanced performances of two dozen or so tracks including all their hits. A close look at the proceedings going on throughout the night revealed little interaction or obvious camaraderie among Rose and Slash, but it would be hard to argue with the overall power of the band's performance. There was a 20+ year span between the departure of Slash and his rejoining the band earlier this year, but musically the two locked in as if they had never parted. 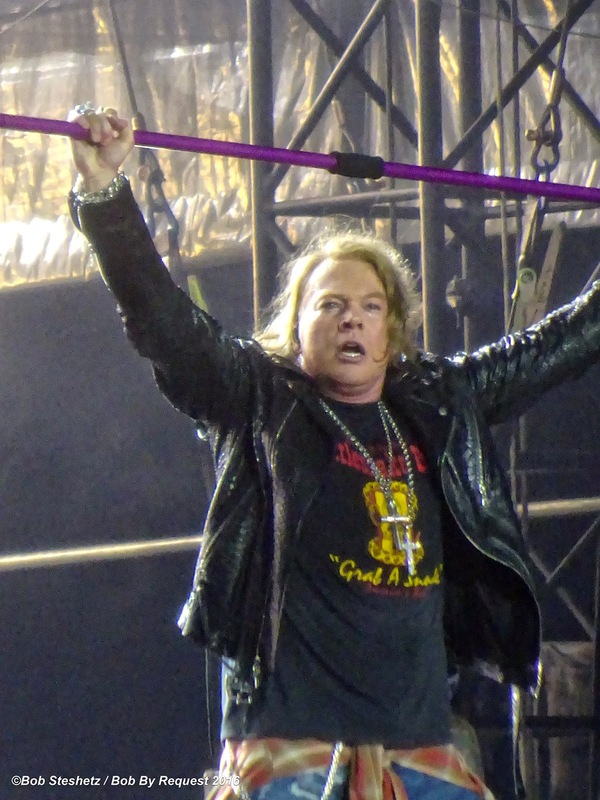 After performing "Mr. Brownstone," Rose looked out at the crowd and said: "Los Angeles, my neighborhood. What a beautiful day in the neighborhood." That was about as far from the rock music, bright lights, video images and pyrotechnics that things veered. The night was all about the big show and highlights came often. A driving "Welcome to the Jungle" found GnR rocking as video images of futuristic skyscrapers raced by behind the band. Slash's distinctive, technically precise, flashy and affecting guitar work was a highlight of that song (and many others this night). Not long later, a cover of Paul McCartney and Wings' "Live and Let Die" incorporated strobe lights, and images of firearms and the sound of gunfire into the song's attack. Slash, left and Axl Rose on August 18. But the night's best performances came during the second half of the show, beginning with a potent take on "Civil War," with the song's recorded segment from the film "Cool Hand Luke," acoustic intro and hard-charging rock section questioning the costs of war executed with power. "Sweet Child O'Mine" is among the band's best songs, and afforded yet another chance to see where GnR's music frequently has outdistanced the majority of its hard rock contemporaries. 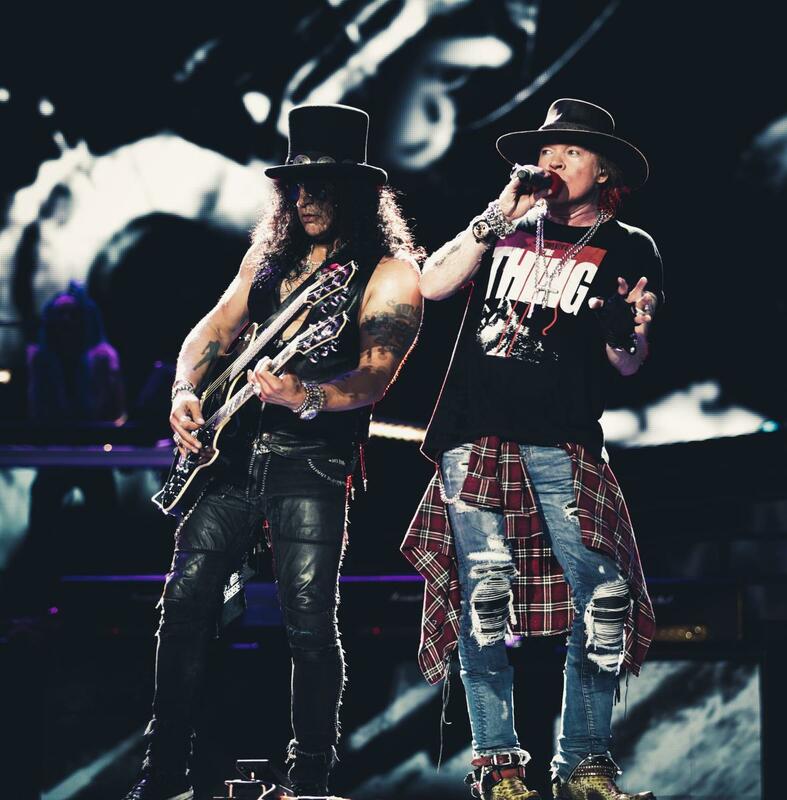 The song's powerful melody, as well as Slash's brilliant guitar work, had everyone temporarily forget about their smart phones and actually pay attention to the group's performance. GnR's encore was a home run befitting the Dodger Stadium site, including performances of the folk rock original "Patience," a fiery take of the Who's "The Seeker" and GnR's own epic rocker "Paradise City" sending the faithful home with a bombastic finale. Although the Cult hails from the other side of the Pond, the group provided plenty of good reasons to celebrate their performance on the big stage. Armed with material from a great new album (2016's "Hidden City"), the Cult's singer Ian Astbury and guitar great Billy Duffy led the troupe through a fast-moving set featuring '80s rock favorites ("Wild Flower," "Lil' Devil," "She Sells Sanctuary" and set-ending "Love Removal Machine") and new material ("Deeply Ordered Chaos"). Good news for local audiences is the Cult will perform at Jack's 11th Show at Irvine Meadows on Sept. 23.